If one's primary source of income is driving commercial trucks, then they will want to live in a city that they feel comfortable operating and one that is friendly to the industry. A city that welcomes those who make a living by driving trucks must understand and care about the specialized needs of commercial truckers. In any profession, it is important that a person’s home base be a good fit, but especially for truckers, a city that provides a welcoming and friendly environment involves much more than just a relaxing home to spend time outside of work hours. How “friendly” a city is to commercial truck drivers includes such items as the pay scale relative to the cost of living, housing expenses, road regulations, approachable law enforcement, speed traps, quality of the roads (think potholes), and route restrictions. If a driver has the flexibility of determining the location of your home base, there are some basic components of the trucking industry to keep in mind. The shape of the physical infrastructure will vary from state to state, and often from city to city. More rural areas with less roadways may see a severely different quality of road as opposed to a driver in a major city. While drivers themselves can do little about the quality of roadways themselves, they should research the quality of roadways in a particular area they may be trucking in. According to the Owner-Operator Independent Drivers Association, there are approximately 350,000 owner-operators registered in the United States. These individuals are responsible for the upkeep and maintenance of their own trucks and all associated costs. Their biggest investment is their vehicle which allows them to make a living. Anything and everything these drivers can do to keep costs down is a priority. Cities and states that support the quality of their roads and highways make them a winner for all drivers, especially those with a commercial driver’s license. The greater the ease for the above functions allow for goods to move throughout the country safely and effectively. A multitude of driving options and available roadways allow drivers to reach their destination as quickly and competently as possible and provide easier working conditions for commercial drivers. 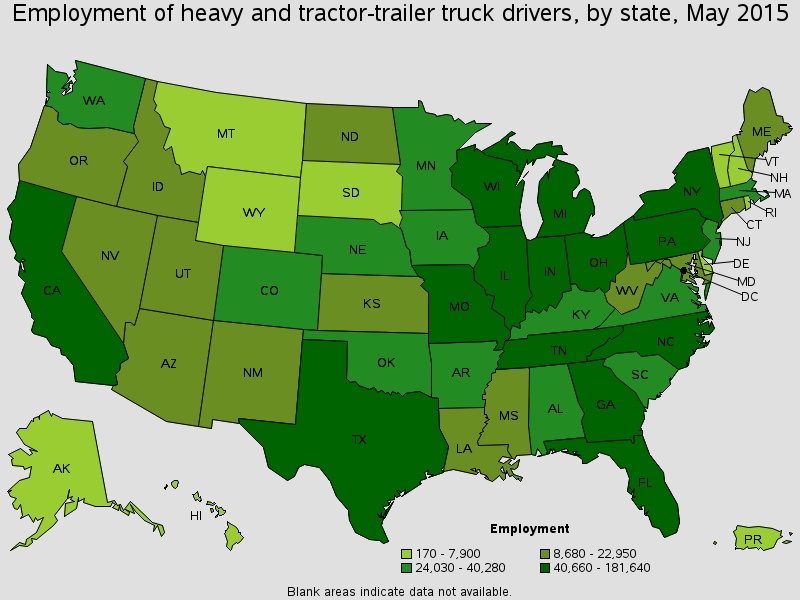 Naturally, what truckers earn help determine where they want to live. The Bureau of Labor Statistics found that the average yearly pay of a truck driver at just over $40,000. However, a salary is often dependent on one's location. 1. 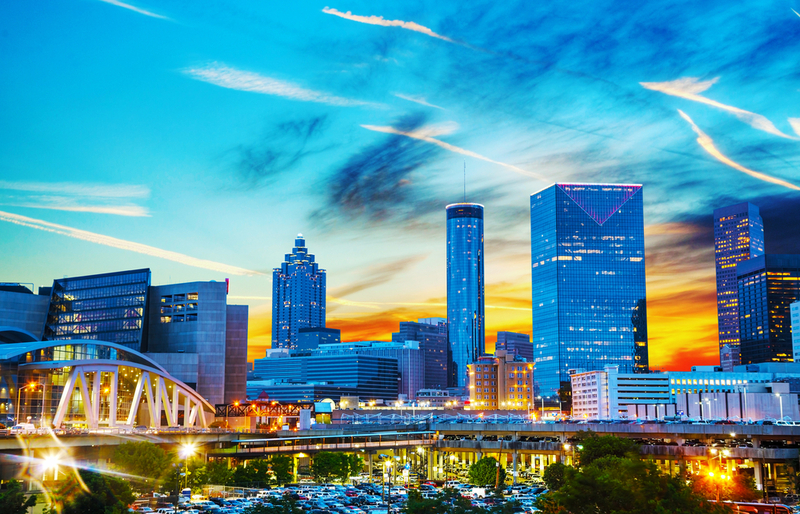 Atlanta, Georgia - Atlanta has the highest share of trucking jobs. Plus, there is a high annual driver salary of $64,000, way above the national average of $40,000. The Coca-Cola company employs a great deal of drivers in the area, so it is easy to understand why Atlanta grabbed the number one spot. 2. Charlotte, North Carolina - Truckers in Charlotte make an average salary of $55,000 per year and find that the cost of rent is extremely affordable. Charlotte is among the fastest-growing cities within the country, a hub for new energy and a growing demand for the motorsports industry. 3. Columbus, Ohio - Both rent and the median cost of a home make Columbus an affordable city in which to live. Known frequently by many financial institutions as one of the best locations in the country for a career in commercial transportation, as well as a major spot for many relocating to choose a more viable career path. 4. Indianapolis, Indiana - Home to many major transportation companies such as Celadon Trucking, Indianapolis has always been a city that has seen a great deal of reliance on the commercial transportation industry. Indianapolis has an estimated 223 million individuals employed in the realm of trucking. 5. Chicago, Illinois - This city is the third largest metropolitan area in the US and although a city that is on the more expensive side, Chicago truckers make an average salary of $61,000 per year. Additionally, the Illinois Trucking Association ranks the city as one of the busiest intermodal ports in the world. Yes, it’s true that some cities, including New York City, deliver a higher pay scale, however, the price (both financially and culturally) to live in NYC is an entirely different beast. As a truck driver, you want to always be pulling a load. It is the most efficient way to make money. This means that after a shipment is delivered, you want to be loading up on that very same day as you bring it back home. Some cities and states offer more opportunity to acquire back-to-back jobs. 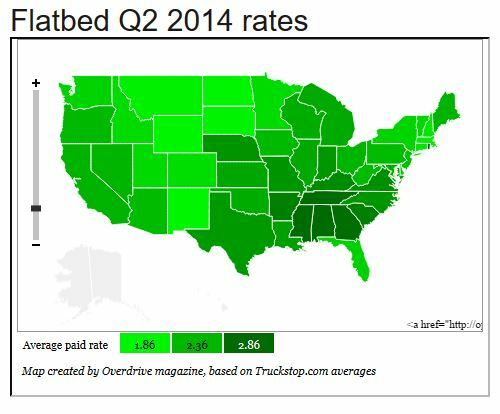 However, not all loads are created equal and the prices vary dramatically by state. In 2015, a survey showed that Mississippi and Georgia were in the lead. When deciding on the friendliest locations to run their business the actual owners of small trucking companies have specific requirements they need to consider.These owners are focused on items that affect their bottom line profit such as the cost of overnight fees for parking, as well as fuel costs, taxes, and regulations. 1.Tennessee: Minimum regulations, lack of traffic concerns, low diesel fuel costs, roads in good condition, more driver freedom, and a favorable tax structure all combine to make this state the number one choice for many drivers and over 400 companies. 2. Washington: The Pacific Northwest is famous for being a fishing port and midway stop between California and Canada, making it a busy corridor. Those interested in hauling manufactured aircraft parts should consider this state as one of the friendliest. There is the opportunity to haul loads for large corporations such as Boeing, which is based in Seattle as well as technology companies, which pay well - as Microsoft and Amazon are headquartered here. 3. Oklahoma: Solid pay and the ability to find many trucker-friendly stops along the way are some of the benefits that make this state a top rated location for small trucking companies. Oklahoma also delivers low gas prices and has relatively few regulations on the industry. 5. Indiana: Whether one is new to the transportation industry or a seasoned veteran, Indiana offers advantages for finding a truck driving job such as a major economical infrastructure bolstered by agriculture. Indiana has seemingly always been friendly to the field of commercial transportation, with over 4,200 miles of railroad in the state and over 2000 on-ramps estimated within the state. States that did not make this list of “friendly” locations have conditions that hinder truckers from doing their job. This includes the implementation of strict emissions regulations which require expensive and more specialized trucking equipment (i.e. California). Also, high fuel prices along with complex labor laws, regulations, fines, parking shortage, difficult weather and tough terrain (i.e. Virginia, Ohio, New Jersey and Massachusetts) put these states at the bottom of the list in this evaluation. However, states such as CA and the above all offer their own opportunities - it would behoove a driver to do complete some practical research and find out which area will suit them best. Becoming an owner/operator and running a small trucking company requires great responsibility and commitment. Data reveals that these motivated individuals value stability in their lives and have lived in the same “truck friendly” area for over eleven years. This indicates how important it is to do your homework and identify the best location for a business. The average age of becoming an owner-operator is 37 years old and almost all (95%) run solo driving an average of 101,000 miles per year, so clearly, truckers value permanence in their home base. When it comes to trucking, every state will offer different opportunities and challenges. Availability of jobs, state regulations, average pay compared to cost of living, and even income tax all influence the overall friendliness of a state to a driver. But perhaps one of the most vital components in deciding on where to base your work and home is the quality of life you are searching for. For many employed in trucking, the friendliest states may be those that offer work/life balance incorporating well-kept truck stops and inexpensive overnight parking costs. The ability to live and drive on a major route that allows for making frequent stops at home is also a major advantage to those with families. These factors reduce stress, time expenditure, and out-of-pocket expenses for drivers while increasing job satisfaction. As the need for commercial truck drivers increases, you should have no problem finding truck driver jobs in whichever city one desires. By investigating multiple options and prioritizing the needs of the job, there is no doubt drivers will identify the best place to advance their truck driving career.